Vida Samiian demonstrates against the presence of Israeli academic Ronen Cohen at a conference of the International Society for Iran Studies in Santa Monica last year. Our own Dr. Vida Samiian, Dean of the College of Arts and Humanities at California State University, Fresno (CSUF), testified at a meeting of the California Public Employees Retirement System’s Investment Committee in February. Samiian and others are asking the pension fund to divest from companies that sell military and other equipment to Israel. I’m here today because I’ve traveled to Israel-Palestine as part of Faculty for Israeli-Palestinian Peace on a number of occasions, and have observed firsthand the death, destruction, and numerous violations of human rights and international law that are systematically inflicted by Israel on Palestinians in the occupied territories. Israel has contrived to make Gaza an open-air prison, purposefully keeping Gaza’s inhabitants at a subsistence level of existence as a form of collective punishment, also a criminal act under international law. This is not a situation that CalPERS should subsidize through investment in companies that help maintain these violations and criminal behavior. Knowingly doing so makes us all complicit in the crimes Israel and its government is committing every day against Palestinians on their occupation. Note that her accusations are entirely context-free. Listening to her statement and those of the others that testified that day, one would not guess that Israel is a country that has been under constant attack since its founding by the Palestinian Arabs and their cousins and supporters in neighboring countries. The word ‘terrorism’ does not appear. It isn’t mentioned that the hated ‘checkpoints’ have stopped numerous terrorists, weapons and explosives from entering Israel. There is nothing about the rockets that daily land on Israeli towns. Samiian targets her educated American audience (see my post yesterday entitled “Secrets of Palestinian Arab Propaganda”) with her comments about segregation, human rights, ethnic cleansing and violations of international law. But none of these concepts actually apply. ♦ There are no “settlers-only roads.” This particular lie has been refuted over and over. There are places in the territories where access roads between certain Arab villages and main highways have been closed after numerous murderous drive-by shootings occurred. ♦ Settlements are not “illegal.” This is a long story, which I told in more detail previously (“A classic big lie“). ♦ There is no “systematic segregation within Israel proper.” Israeli Arabs are not required to sit in the back of buses, denied the vote, excluded from serving in the military (although, unlike Jews, they are not required to do so), forced to live in ghettos, forbidden to work in certain occupations, forbidden entry to universities etc. ♦ Yes, Israel defines itself as a Jewish state. So what? There are 22 other nations in the Middle East that define themselves as Arab states, and the proposed constitution for ‘Palestine’ declares it to be an Arab state whose official religion is Islam, and the main source of whose legislation is shari’a. ♦ Have there been “30 years of ethnic cleansing” in the territories? Not exactly — the total Arab population of Judea, Samaria, eastern Jerusalem and Gaza went from 1.04 million in 1970 to 3.76 million in 2005. Compare this to the fact that the Jewish population of those areas went to zero in 1948. Now that’s ethnic cleansing! ♦ The “open-air prison” where the inhabitants live at “subsistence level”? The International Red Cross has stated that “there is no humanitarian crisis in Gaza.” The only items that Israel limits today are strategic materials. Yes, there isn’t enough concrete for infrastructure repairs, but Hamas has prioritized its use for bunkers and tunnels in preparation for war. Gaza Arabs say that they cannot lead a “dignified life” under these conditions, but Hamas has only to stop making war in order to get remaining restrictions lifted. Speaking of international law, the constant rocket fire against Israeli civilian targets, the frequent attempts at incursions over the border and the continued detention of Gilad Shalit — since June 2006 — without permitting him contact with the Red Cross or communication with his family, all constitute violations of International law by Hamas. In November 2003, Dr. Samiian organized ‘Palestine Day’ at CSUF. Speakers included the renegade Israeli academic Ilan Pappé on the Israeli-Palestinian conflict, Dr. Saleh Abdul Jawad on “The End of the Two State Solution: Apartheid, Bi-national State, or the Final Stage of Socioside” [sic], the film “Jenin, Jenin” which falsely depicted a ‘massacre’ that never occurred, the film “Gaza strip”, and more. Jewish students who attended said that the atmosphere was not only anti-Israel, but also antisemitic. Samiian is also director of CSUF’s Middle East Studies Program, which held a conference in 2008 from which I quickly exited in advance of being ejected. A look at the MESP website shows programs in Farsi and Arabic, an opportunity to study in Cairo, and numerous courses related to Islam and Islamic civilization. None of the faculty listed — except one, a specialist in Islam who has an interest in the relationship between the three monotheistic faiths — appear to have any background in Hebrew, ancient Israel, Judaism, etc. The “Middle East” at CSUF doesn’t include the Jews. 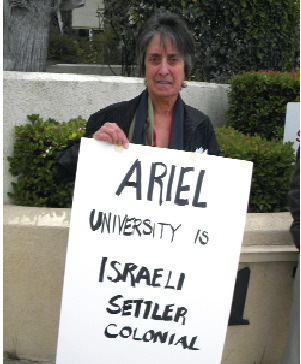 Last year (see photo above), Samiian participated in an attempt to prevent an Israeli academic from Ariel University from speaking at a convention of the International Society for Iran Studies (ISIS) in Santa Monica. Despite her appeal to the principle of academic freedom and ‘balance’ to justify the slanted ‘Palestine Day’ event and Middle East Studies conference, her commitment to it apparently stops at the Green Line. Dr. Samiian may be a competent scholar in her field, but she is also a dedicated political activist, one whose position gives her a unique opportunity to promote the Palestinian Cause. Which, if you remove the wrapping designed to obscure its true nature and make it palatable to Western tastes, is the destruction of the Jewish state and the death or dispersal of its inhabitants. It really is that simple. This entry was posted on Thursday, April 21st, 2011 at 4:59 pm and is filed under Academia, General, Local interest. You can follow any responses to this entry through the RSS 2.0 feed. Both comments and pings are currently closed.